Leverage from one of the Kings of knowledge sharing and thought leadership, B2B SlideShare marketing has the potential to be a great way to lead the field when representing your company to the German market. SlideShare is an online content sharing tool based around uploading, viewing and sharing such file formats as Microsoft PowerPoint, Apple Keynote, OpenOffice files and more, all from one website. SlideShare is heavily used in the B2B segment to showcase and provide information on an infinite number of topics. Companies use SlideShare when giving conference events and to present information to customers. The standard account is free, but Pro users benefit from analytical data among lead generation management tool LeadShare, and engagement measurement tool Send Tracker. Today, with many free online tools or professional software suites, great content creation is in the hands of every employee to transfer knowledge online for relevant B2B leads to find and consume. With many international companies already operating in their domestic markets with seminars, presentations, internal documents, marketing and corporate design documents, the only thing to stop a move into Germany would be difference in the culture, the market and the language. Many companies are far nearer to publishing their existing content in different languages than they think. SlideShare was taken over by LinkedIn in 2012 which has opened up enormous B2B potential on the content sharing front. We cover all sorts of social media marketing and account management among other things such as Facebook applications and advertising, but especially LinkedIn and SlideShare on the B2B side. Just in the same way companies acquire local competitive advantages when moving into a market to gain valuable insight, the online world is similar. It is invaluable to your transition into marketing activities in Germany when you take into account the experience required to define and understand your target audience, know and live with the cultural differences and speak and master the language. Hence webvitamin is your online B2B SlideShare content marketing solution to not only adapt and translate but to interpret analytical data, and above all with over 13 years sales and marketing experience to offer the best results possible from your publications. 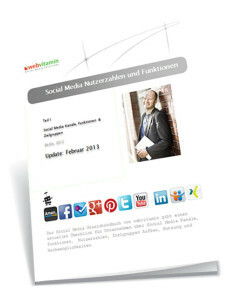 We also offer complete content solutions for you in the German language, also serving as a content publisher for your marketing operations in Germany, for example taking raw data and transforming it into valuable case studies and performance showcases to inspire potential new sales leads through B2B SlideShare marketing. One of the most practical elements to a B2B SlideShare marketing strategy is the ability to be social with data. Rather than the standard status update, photo or link to a blog post, sharing documents opens up the accessibility and makes content easier for internet users to consume by making content social and stored all within one platform. Users are attracted to useful tips generally targeted at solving a problem about business topics, be it social media strategies or human resources tips among many. B2B SlideShare content intrigues people as to who are the company or the people behind the content when it is easy to consume, meaning easy to understand and not time consuming to digest and relevant to a specific topic of interest. The great part is that the insightful content is leveraged to showcase the company behind it without revealing sensitive knowledge or information. The way companies do this is to engage customers with enough interesting information to spark a potential lead creation. On the Pro version of SlideShare, businesses get the opportunity to present their slides, then when the user reaches the last page, a contact form drops down to attract the user to send a message. Companies showcase their potential through B2B SlideShare marketing towards target businesses, ultimately giving up a little information to create added brand value with the customer from the free insight, but then not enough information to not warrant the existence of the businesses‘ products or services. Quality content should tell the consumer what they need to solve a problem, but not necessarily how, because that is when the B2B SlideShare customer will reach out to communicate for the first time. SlideShare offers the tools to capture and analyse lead generations and their quality, called LeadShare. The social aspect can lead to content getting shared in ways and to different people never deemed possible by a static website among million of others buried in search engine results. 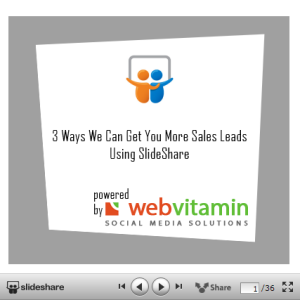 B2B SlideShare content can be shared, liked, saved and embedded into other websites or blog posts. Sound and video can also be included into SlideShare uploads. What’s more, SlideShare uploads can include links embedded into text for search engine optimisation purposes which can contribute to a better search engine ranking, but also the ability for users to share the content over various social networks such as LinkedIn and Twitter. Our agency offers quality B2B SlideShare seminars, profile management and the possibility of exclusive content creation in German. We offer this services especially to companies looking to either generate new sales leads or launch their products and services to the German speaking market.